It's 1920. 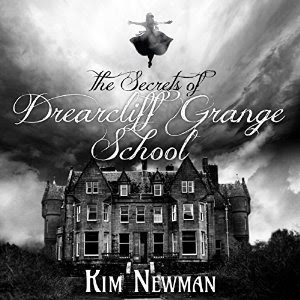 Amy Thomsett's mother finds her sleeping on the ceiling, and a week later packs her off to the Drearcliff Grange School, a boarding school on a rather bleak stretch of the English coast. Drearcliff is a special sort of school in some respects; the more mundane way is that many of the girls who attend there are missing one or both parents. The other way in which it's special is that many of the girls are what the headmistress, Miss Swan, calls "unusuals." Like Amy, they have abilities or attributes that don't seem entirely natural. At first Amy has fairly normal boarding school experience--getting to know her roommates, her housemates in Desdemona House, her teachers, and the rest of the school. The roommates include Frex, a.k.a. Lady Seraphina, who thinks her brother is trying to steal all the money left to her by their parents; Cali, a Kaffir bandit princess who says her father murdered her mother; and Lightfingers, the daughter of a pair of thieves who were highly successful until they weren't. It turns out they have "unusual abilities" that are key to their previously successful careers of thievery, burglary, and fraud, abilities which Lightfingers has inherited. It also means getting to know the power structure of the school--not just the instructors, but the power structure among the students--the head girl, the "whips," and their supporters. It's sometimes rough and challenging, but the previously lonely Amy now has friends, too, and enjoys many of her classes. Then two things happen to change things. First Cali is kidnapped, and when the headmistress and other instructors don't believe the obviously "wild story" about kidnapping but conclude she has run away, Amy has to organize her friends into the Moth Club, to find and rescue her on their own. Then Rain arrives. Something ominous is happening at Drearcliff, and it falls to Amy to organize those of her friends who have not yet succumbed. Obviously, this is a well-loved, well-trodden path for fiction going back decades longer than the currently most famous example of "boarding school for the magical" fiction, but this as an excellent example of it. Minus the ability to float, Amy and her loneliness and insecurity, and relief at having any friends, reminds me of me at that age. She and her classmates are real human beings, with strengths and weaknesses, and the plot keeps moving, while taking some twists and turns I didn't anticipate.